Christmas Eve was peaceful since all of my shopping was over. My sister asked me to make gingerbread cookie dough and, amazingly, I had all of the ingredients on hand. The plan was for me to bring the dough to my mother's house on Christmas and we would bake and decorate cookies. I started thinking that it would be nice to be able to taste them now and I also was trying to think of something non-materialistic to give to my tiny house visitors. Inspiration hit - a tiny gingerbread house! 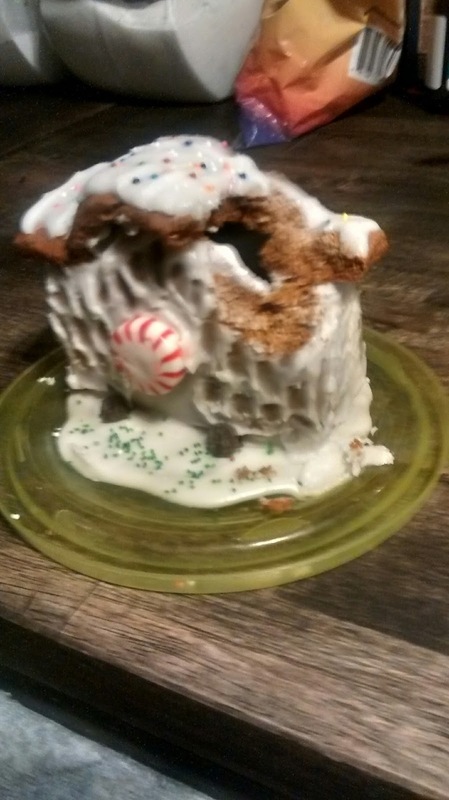 And not just any house, but a tiny gingerbread house shaped like their house. I didn't have many candy decorations since this was a spontaneous idea but I had a few sprinkles and the perfect round peppermint for the door. I ate the scraps, which were tasty. 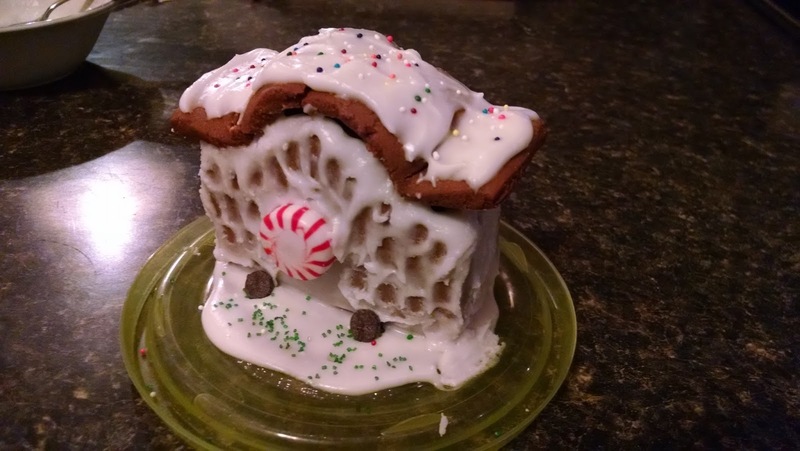 On my way to my mother's house on Christmas, I left the tiny gingerbread house outside and left them a text message. They found it and were delighted. Then they sent this picture back. Hansel and Gretel have been nibbling! I had a wonderful Christmas with my family and the cookies turned out great as well as the dinner that my sister made for us. The next day we did some after-Christmas shopping and returns. It wasn't very crowded because my mother lives in a small town. On Tuesday, my sister and aunt left for their respective states and I had to go back to work. I took Friday off and my mother and I drove around doing errands. We were discussing options for her to move near me or in with me. We visited my property and thought about replacing the single wide mobile home with a new one. After visiting some new mobile homes, I wasn't sold on the idea because they all smelled like formaldehyde and were cheaply made. Then we thought about building something small on the property but the cost to build plus a $30K well, plus a $6K septic system was adding up fast and it is still a relatively remote location, as in, dirt roads, 15 minutes to groceries, 30 minutes to a hospital, and most of her doctors are on the opposite side of town. Then I looked at buying another house if my mother and I pooled the money from the sale of both of our houses but everything that I looked at needed modifications or was too expensive and I really don't want to tie all of my money up in another house. My latest idea is to make my house in town, which I am living in now, work for the both of us after my nephew leaves for college. This might put off my move to my tiny house but it is all just ideas at the moment. I could enclose the carport to make what they call an "Arizona room" for my mother. She would be on the opposite side of the house, away from the dogs to give her more quiet and privacy. I haven't gone out for quotes on all of these ideas yet but I will. So, what about that water leak? Like I usually do, I put it off for now. I bought a trash can and tried out the washer with it draining into the trash can. No water leak. I do have to empty around 15 gallons of water after every load though. I've actually thought about doing this and using the water on the plants outside to save water in the summer, and now I'm doing it by necessity. When I get the contractor to come out, I'm going to get quotes for the AZ room, a kitchen remodel, and fixing the laundry area. I think I need to take out the shower and put the stacked washer/dryer back in that space. My mother likes to take baths anyway and there is a motorized bath seat which raises and lowers a person in to the tub which we could buy. That might be perfect. The other option was replacing the tub in the guest bathroom with a walk in tub which cost around $1700. 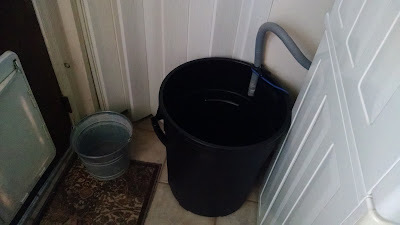 The biggest complaint, besides cost, is having to stay in the tub while it drains before you can open the door. I'll let her decide. i was thinking about your laundry water problem. i had the same issue a while back. i think your drain is semi clogged with tissue or other things accidentially left in your or nephews pockets. you'll need to clear the drain. Could be. He does his own laundry and there have been more than one tissue that have not made it out alive. Lol. You never cease to have a big project get in the way of your financial plan. I know! But it is hopefully just a matter of rearranging my plans like I did when my nephew came back to live with me and I fixed up the mobile home ahead of schedule. Thanks. And it turned out to be tasty too. Psst! The dermatologist doesn't want Mom to take baths while she's on her new medication. Too much bacteria in the water! Well, that will make things easier!